The Railway sector continues to grow, in terms of both passenger transport and transport of goods. 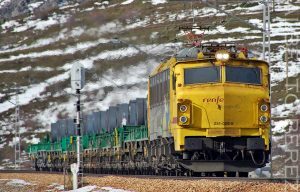 Railway connections to ports are being improved, which reflects the Spanish ports’ support of railway transport. In addition, the development of high-speed railways in Spain (the AVE high-speed train will reach Galicia in 2020) and outside Spain is clear. This means that Spanish companies have a strong presence nationally and internationally, due to their experience and technology. One significant example is the Middle East, where EUR 300,000 are expected to be invested in the next 10 years. This situation makes it possible for the railway sector to be solvent and have good prospects. As for CALDETEC, S.L., it has a presence in various fields in this sector, as a metalworks, welding, and machining company supplying various tools, welded parts, machined parts, repairs, and assemblies. CALDETECT, S.L.’s medium- and long-term aim is to diversify within the market, so as to grow within the railway sector by providing high-quality work and products.